This is the first of four reviews scheduled for Tuesdays in March. 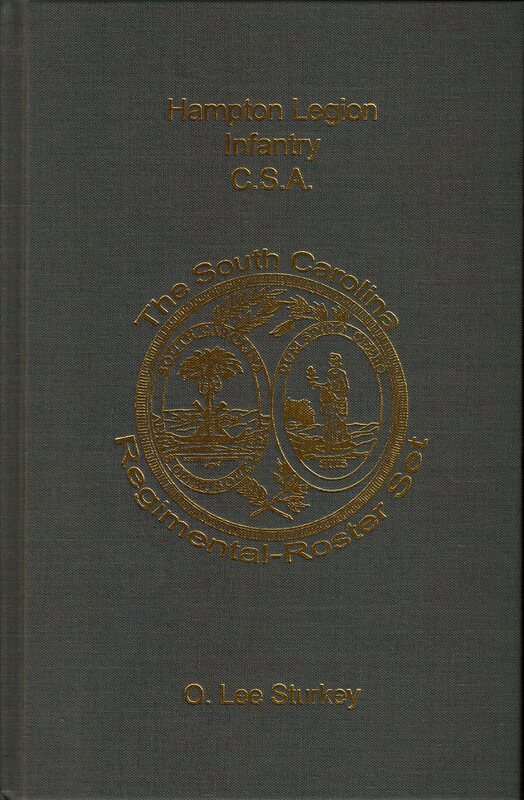 Each review will cover one of the first four volumes of the South Carolina Regimental-Roster Set series from Broadfoot Publishing Company. A significant portion of each review will show you how this particular volume compared to the others in the series in terms of regimental history length, amount of annotation, depth and print size of rosters, bibliography, illustrations, and maps. I do this to show readers just how different each volume can be. The South Carolina Regimental-Roster Set bears a striking external appearance to the H.E. Howard Virginia Regimental Histories series. These books were, in fact designed as a South Carolina answer to the Virginia unit histories. Broadfoot hopes to publish 50 volumes in this set, but that plan is dependent on how well these and subsequent books in the series sell. If you are interested in seeing this entire series printed, I encourage you to pick up these volumes immediately rather than put off purchases until later. Sturkey, O. Lee. Hampton Legion Infantry C.S.A. Broadfoot Publishing Company (2008). 907 pages, roster, extensive notes, bibliography, indices. ISBN: 978-1-56837-409-3 $45.00 (Hardcover). What is usually a solid sign that an author did a lot of research and knows his subject well? Endnotes or footnotes would be the first answers for many deep readers, and this book has plenty of the latter, over 300 pages worth. Lee Sturkey used over 25 years of studying the Hampton Legion to produce an exceptionally annotated work featuring a mainly military history of the Hampton Legion Infantry along with the massive and detailed rosters this series was designed to display. The Hampton Legion was organized by Wade Hampton, the future Confederate cavalry leader, in early 1861, and initially consisted of infantry, cavalry, and artillery. Hampton’s Legion fought as a unit at First Manassas, but was broken up in 1862. The Legion Infantry were a part of Hood’s Brigade during the Seven Days through Antietam, but were later transferred to Micah Jenkins’ South Carolina brigade prior to Fredericksburg. The unit missed Chancellorsville while participating in the Siege of Suffolk, and they also were not present for the Gettysburg Campaign. Shipped west with Longstreet’s Corps in the fall of 1863, they arrived barely too late to fight at Chickamauga, participated in some of the earlier actions during the battles around Chattanooga, and were involved in Longstreet’s Siege of Knoxville. After the Legion Infantry arrived back in Virginia in late 1863, they were reorganized as mounted infantry for the upcoming 1864 campaign and fought that way for the rest of the war. The men saw a lot of action with Gary’s Cavalry Brigade in the fall of 1864 east of Richmond. They were with Lee’s Army of Northern Virginia until the end came at Appomattox Court House. O. Lee Sturkey is a former naval officer and a retired attorney. He has been studying the Hampton Legion for over 25 years, making him an excellent choice to author this unit history. His attention to detail and clear description of events throughout the war serve to make this book an outstanding unit history. The unit history portion of the book weighed in at 137 pages, the second longest regimental history of the first four books in the series. Sturkey supplements the text with an ample number of endnotes, which will be discussed in greater detail later in the review. The author provides the strength of the Hampton Legion infantry when known and estimates the strength when not known, providing detailed notes on how he came to that conclusion. Each battle is described in detail and presents the reader with a good idea of how and where the Legion was involved. In many cases the soldiers of the Hampton Legion are allowed to speak for their unit, though this is mainly a military history with little information into the social aspects of these men. The only shortcoming here is a lack of maps. Unfortunately there were none included with the text. Sturkey writes in a clear and enjoyable style for the most part, the only minor issues being a strange tendency to periodically lapse into present tense and a somewhat biased take on events surrounding the alleged murder of USCT soldiers. His great appreciation for Richard Sommers’ Richmond Redeemed: The Siege of Petersburg, an appreciation shared by this reviewer and clearly evident in the detailed endnotes provided, only added to the enjoyment of the book. In fact a major strength of this regimental history in comparison to the vast majority of such works was the detailed description of the Hampton Legion infantry’s involvement in the Petersburg Campaign. Most unit histories gloss over any fighting after the battle of Cold Harbor, proceeding directly to the Appomattox surrender. Sturkey looks at the unit’s participation in the battles on the north side of the James River throughout the summer and fall of 1864 and covers these actions as he would any early war fight. This continued attention to detail was greatly appreciated and shows the depth of the author’s knowledge on this subject. The rosters, as always a major portion of the book, are as well done as any in the series. Like two of the other three books in this initial print run, the rosters are shown in large print for easy viewing. Like the other volumes in the series, the wartime information contained in the rosters was mainly gathered from CSRs (compiled service records) located in the National Archives. Antebellum and postbellum events were collected from a wide variety of sources, making this roster as complete as any compiled for the Hampton Legion infantry. The roster is separated by company and then ordered by maximum rank achieved. The men of each rank are ordered alphabetically by last name. In a unique feature so far in the South Carolina Regimental-Roster Set series, the rosters are also annotated. Despite all of the good things I’ve said about the book, the best has been saved for last. Lee Sturkey’s notes are located on pages 525 to 860. That is not a misprint. In a 907 page book, more than one third of the pages are dedicated to numerous and often detailed notes for both the unit history and the roster. The notes are so good that anyone wishing to learn about the Hampton Legion infantry should look no further than this book. Sturkey relies on primary sources for the most part, something readers will realize rather quickly even skimming through the notes. A selected bibliography is included on pages 861-868, but this only begins to scratch the surface. Hampton Legion Infantry C.S.A. is a wonderfully detailed unit history with an equally detailed roster to go with it. Even without these features, the $45 price tag would be worth it for the notes alone. Lee Sturkey, a 25+ year student of the Hampton Legion, clearly knows this unit and its “legionnaires”, as he calls them, inside and out. The only downside to the book is a lack of detailed maps. Researchers of the South Carolina units and those with ancestors in the Hampton Legion will want to make this book a part of their collection. However, any reader interested in the Civil War and specifically unit histories should own a copy of this book. I HIGHLY recommend this book, one deep readers will appreciate and thoroughly enjoy.